Section I. Fundamentals of Absorbent Materials: Preparation, Structure, and Characterization. 1. The evolution of absorbent materials (J.R. Gross). 2. Preparation and structure of polyacrylates (F.L. Buchholz). 3. Preparation and characterization of crosslinked hydrophilic networks (L. Brannon-Peppas). 4. The equilibrium swelling behavior of porous and non-porous hydrogels (L. Brannon-Peppas and N.A. Peppas). 5. Characterization of ionic water-absorbent polymers: Determination of ionic content and effective crosslink density (D.C. Harsh and S.H. Gehrke). 6. Swelling behavior of water-soluble cellulose derivatives (E. Doelker). 7. Structure and swelling behavior of poly(ethylene glycol)/poly(methacrylic acid) complexes (J. Klier and N.A. Peppas). 8. Transport in porous polymers (W.M. Saltzman). Section II. Recent Experimental Studies. 9. Molecular thermodynamics of aqueous polymers and gels (H.H. Hooper, H.W. Blanch, and J.M. Prausnitz). 10. Dynamic and equilibrium swelling characteristics of hydrophilic copolymers with carboxylic functional groups (A.R. Khare and N.A. Peppas). 11. Kinetics of swelling of absorbent polymers (F.L. Buchholz). 12. Effect of superabsorber-pulp interactions on the performance of absorbent structures (D.L. Visioli and K.R. Williams). 13. A microstructural analysis of polymer networks formed from graft copolymers in mixed aqueous solvents (C.G. Varelas and C.A. Steiner). Subject Index. In recent years, there has been a veritable explosion of research and development in consumer-oriented fields that utilize polymeric materials which absorb large amounts of water. These fields encompass the preparation, characterization and commercialization of separation systems, pharmaceutical and personal care products such as infant diapers, feminine products, incontinence products and many other related areas. The polymeric materials utilized in these applications are known as absorbent or superabsorbent materials because of their ability to swell rapidly and to retain large volumes of water, urine and other biological fluids. The aim of this book is to introduce the fundamentals of polymer structure and swelling as related to polymers used for these superabsorbent materials. In the field of absorbence, particular attention is given to crosslinked structures which swell to more than fifty times their initial weight in water or electrolytic solutions. 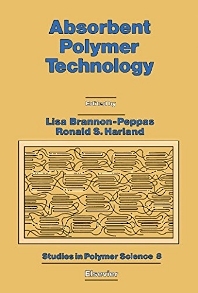 The book also provides descriptions of novel applications of superabsorbent materials as well as a detailed analysis of water transport in crosslinked polymers. Absorbent Polymer Technology should be of interest to chemists, polymer scientists, chemical engineers, and industrial scientists working with swellable polymeric systems in personal care, pharmaceutical, agricultural waste treatment and separation industries.